Let’s Support Indonesian Start up!!! The world of Start Up Business brings new opportunity for both the businessmen of Start Ups and the investor such as ventures. As we know that ventures open their opportunity to give investment in the Start Up Business. Start Up business surely needs more than ideas and technology to support their business. A stable financial support also become the part of Start Up business to grow and develop their market. 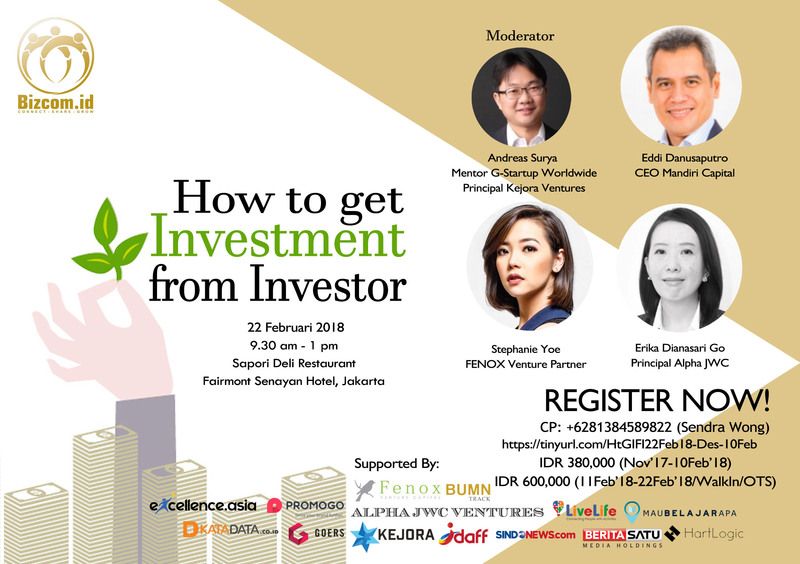 This event held to help Start Up business meet their suitable financial model and for the ventures as investor to meet their match Start Up business. Business owner, Investors, Banker, Professionals, Start up Founders,People with Social Economic A+, A, B+, B in the range of age of 25 - 60 years old, SME Owner, Self Employment.